I do lots better when I work with small details at a time instead of large washes to cover large areas. I really don't like trying to reproduce someone else's work. So what does that mean? It means my next watercolor piece is going to have lots of small details that I am going to work on and it is going to be an original, not copied. Oh, and I plan to do a WIP of it. So keep an eye out. I will try to post something tomorrow with at least some bits of pieces of ideas that I have for it. 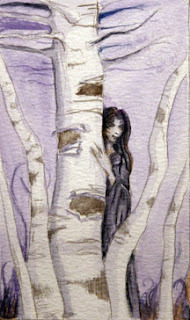 Well, here it is, the Birch Dryad. This is another one of the lessons from the book that I mentioned in a previous post.